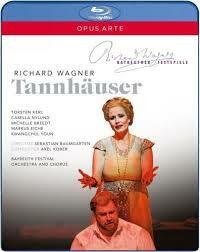 The Baumgarten/van Lieshout production of Tannhauser opened at Bayreuth in July 2011, conducted by Thomas Hengelbrock. The production was not well received – according to Mark Ronan’s review in the Telegraph, the production team received vocal boos with not a single clap of applause. This Blu-Ray was recorded three years later, on 12 August 2014 with Axel Kober at the podium and a substantially different cast (only Camilla Nylund remains of the original principals). Judging by the applause at the end, the Bayreuth audience seems to have mellowed with time. My own sympathies lie somewhere between the hostile 2011 audience and the more generous 2014 audience. There are lots of good ideas in this production. Basing the staging on the Dutch performance sculptor Joep van Leishout’s installation ‘Technocrat’ is one of them. I may be an outlier here, but I found the inside of a factory both visually appealing and an interesting metaphor for the world that Tannhauser opposes to the Venusberg – and also for Tannhauser’s own experimentation. The Venusberg itself is a cylindrical cage that arises out of the bowels of the stage at appropriate moments, bathed in red light. I also liked the way that Venus makes silent appearances outside the Venusberg, both in person (in the Act II contest, for example, where she has a seat in the audience) and metaphorically (in Elizabeth’s bright red dress and her occasional departures from maidenly decorum). There is definitely the making of a good production here. There are also some truly awful ideas. Having Venus be heavily pregnant is one of them. Her fumbled couplings with Torsten Kerl, who is roly poly at best, looked ridiculous, and a powerful final scene was weakened by the eventual appearance of Venus’s baby. Nor is there any need for slapstick between Tannhauser and a conspicuously inebriated shepherd at the beginning of the Wartberg scene in Act I. In fairness, though, most contemporary Wagner productions have at least one absurdity in them. The real problem with this production is that there is far too much going on. Van Leishout’s installation has multiple levels. This allows the characters to move around, breaking the visual monotony of some of the set pieces. But why have extras constantly moving around doing mysterious things with machinery? Further distraction comes from the projected son-et-lumière show at the rear of the stage. Not a bad idea, and the images were interesting. But in the context of everything else going on all it did was add to the confusion. Joep van Leishout and Sebastian Baumgarten really need to learn that less is often more. It’s not a coincidence, I think, that the most visually satisfying part of the performance was Act III, where the "busy-ness" levels seemed significantly lower. With less conceptual clutter the dramatic devices came across more effectively – e.g. Wolfram dancing with Venus and the obsessive cleaning of the “cleansed” pilgrims. The vocal highlights of the performance are Markus Eiche’s Wolfram von Eschenbach and Camilla Nylund’s Elisabeth. Eiche combines delicacy and command. Wolfram comes across as much more complex and less “fussy” than he is often portrayed. Eiche is particularly fine in the opening of Act III. Elizabeth, who is so often portrayed as a rather smug puritan, is also revealed to be a much more multi-dimensional character who Like Tannhauser battles with the temptations of the Venusberg. Michelle Breedt’s Venus sings with verve and passion in the Venusberg, but doesn’t project as well as she might. Kwangchul Youn is a fine Landgrave, although the role does not demand much by way of acting. The real disappointment was Torsten Kerl’s Tannhauser. As so often the tenor lead is the weak link in the chain. Kerl has certainly got the volume of a heldentenor. This serves him well in his entrance into the Wartburg in Act I, and again in the climactic moments in Act II when he has to project over the choir and full orchestra. But he falls sadly short wherever vocal characterization is called for. There some moments in Act III (particularly recounting his pilgrimage to Rome) when Kerl shows what he might be capable of, but he soon lapses back into belting it out at the top of his voice. His enthusiastic reception by the Bayreuth audience surprised me. The Bayreuth Festival Orchestra is in fine voice in this performance. Axel Kober (music director of the Deutsche Oper am Rhein) made his Bayreuth debut in 2013. He is clearly at home with the score and paces the work extremely well, maintaining dramatic focus through the music even it appears to be total chaos on stage. The partnership between orchestra and choir is excellent, with both outbound and inbound pilgrims’ choruses working extremely effectively – at least from a musical point of view, it being a tribute to Chorus Master Eberhard Freidrich that the choir sings so well even when asked to do rather bizarre things on stage. The sound quality is very good. I listened in LPCM stereo – a DTS multichannel option is also available. There is fine camera work (including some unusual overhead shots) and the Blu-Ray is well-provided with extras, including biographies of the principals. My only complaint is that Opus Arte (unforgiveably) play the credits over the opening of the overture – this ghastly habit has to stop! It would be hard to recommend this as a go-to Tannhauser, but the concept of the production is interesting and controversial enough that Wagnerians not able to get to Bayreuth will want to take a look themselves.